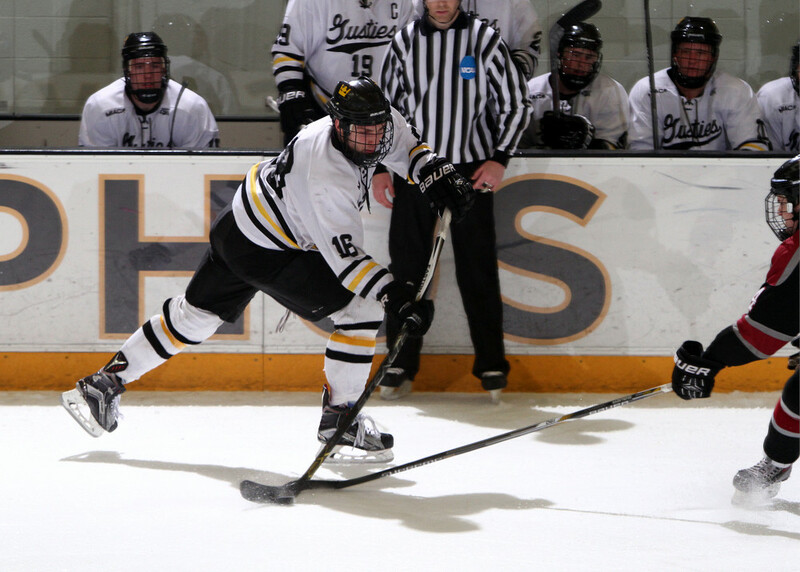 ST. PETER, Minn. –The Gustavus Adolphus College men’s hockey team tied Hamline University 1-1 Friday night, but dropped a point with a shootout loss at Don Roberts Ice Rink. Although the first two periods went scoreless, both teams scored in the third, ending regulation 1-1, but a shootout goal gave the Pipers the second point in the league standings. The loss brings Gustavus to 6-13-5 overall and 5-7-3 in the conference, while Hamline moves to 8-11-6 overall and 5-8-3 in the league. With one game remaining in the regular season, both the Gusties and Pipers are still fighting for the fifth and final MIAC Playoff spot. The Gusties are one point behind the Pipers and St. Olaf for the last spot and can clinch a berth with a win tomorrow and another St. Olaf loss. The Gusties and Pipers held each other scoreless through the first and second frame. The two squads went back and forth in the first frame, with seven shots on goal for the Pipers versus six from Gustavus. During the second period, the Pipers stepped up, putting 13 shots on goal versus three from the Gusties, however both teams went into the third period tied 0-0. The Gusties opened the third period strong, as Gavin Tufte (Sr., Blaine, Minn.) sscored his third goal of the season at the 1:47 mark, finding the top-right corner of the net. Sophomore Jake Bushey (Duluth, Minn.) was credited with the assist. Hamline answered the Gustie goal just two minutes later at the 3:52 mark, as Charlie Adams found the net off an assist from Brandon Zurn. The frame ended 1-1, leading to an overtime where both teams went scoreless. The game went to a shootout, which was won by the Pipers on their third shot. Erik Johnson (Jr., Sauk Rapids, Minn.) made a number of great saves, totaling 31 on the night. Despite the loss, Gustavus found reason to celebrate, as seniors Darren Lapic (Sr., New Prague, Minn.) and Tufte suited up one last time for the final home game of their careers. The Gusties play the second game of the series against Hamline tomorrow at 7 p.m.